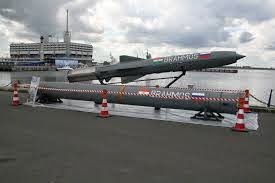 BrahMos, The name is derived from the name of two mighty rivers namely Brahmaputra and Moskva, is a supersonic cruise missile being jointly developed by India and Russia.It is the world fastest cruise missile with speed of mach 2.8 to 3.0 with flight range of upto 290 km. It has capability of striking targets by flying as low as 10m in altitude. This missile have remarkable accuracy of 1m. BrahMos is powered by a two-stage propulsion system. First stage acceleration is provided by a solid-propellant booster and second stage supersonic cruise speed is provided by a liquid-fuelled fuel efficient ramjet propulsion system providing the BrahMos with a longer range over similar missiles powered by rocket propulsion. The ship-launched and land-based missiles can carry upto 200 kg warhead, while the aircraft-launched variant (BrahMos A) can carry upto 300 kg warhead. This missile can be launched from Submarines, Aircrafts , Ship or Land. The land launched and ship launched versions are already in service while air and submarine launched versions are currently in testing stage.As and when air launched version will join air force , it will make India the only country with supersonic missile in Army, Navy and Airforce. Advanced satellite navigation systems and GPS-GLONASS technology were added to the BrahMos missiles in 2013. A hyper-sonic version of the missile namely BrahMos - 2 is currently under development which can travel upto speed of mach 7 becoming the fastest hyper-sonic missile in the world.